Tim Burton, along with his usual cast and crew, has made a brand out of taking quirky characters and seeing them through an idiosyncratic world. What was once borne out of respect for human emotions and an attempt to bring a certain gothic sensibility to cinema, is now a full-on machine doing twee stuff on screen in a crass attempt to make us mistake odd-ball people making bland jokes with wit and charm. Based on a really old but long-running soap opera, Dark Shadows is a story of someone out of time, and a love triangle that may have been interesting if not for one angle of it being as listless as a door post. It requires the sort of deft touch of hand that Tim Burton no longer seems to possess; instead he relies on the age-old gag of inserting a 200-year-old vampire in the role of psychedelia and rock and roll. It's Austin Powers in reverse, and everything that comes with that phrase. 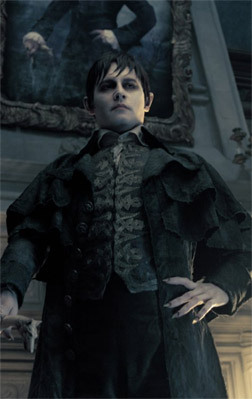 The film starts off much better than as it goes along, with the quick history of the Collins family, leading to young Barnabas Collins (Johnny Depp), heir to the Collingwood estate and perpetually torn between a maidservant who is secretly a witch Angelique (Eva Green), and his true love Josette (Bella Heathcote). In a fit of jealousy and rage, Angelique lets Josette die by jumping off a cliff, and turns Barnabas into a vampire, then locking him in a coffin buried under the earth. 200 years later, the Collins family business is in ruin, a young girl who looks a lot like Josette is drawn to the town, applying to be the nanny of the young Collins ward, and Angelique now owns the town, having brought the Collins family business to its knees. When construction workers inadvertently unearth Barnabas, the fish-out-of-water jokes ensue, with him professing shock at everything that the new century has to offer. In the middle of these tedious gags, there is Eva Green chewing the scenery, and being the best thing about the film. She completely nails the old-woman voice in a young woman's body, and has the presence and energy to overshadow a usually reliable Depp. Green builds layers into her manifestly evil character, sowing doubts into Depp's and our minds. It's masterful, and the only thing that makes the film worth watching. Depp is dependable, though the rest of the cast fails to create an emotional center to the film. This is as much the director's fault as any, as Burton fails completely in making us care for these people and their fates. The final climax thunders and booms under the weight of imagination and CGI messily thrown together in a spectacle that awes, but never shows the passion that Barnabas Collins has for his 200-year-old love. Be the first to comment on Dark Shadows! Just use the simple form below. fullhyd.com has 700,000+ monthly visits. Tell Hyderabad what you feel about Dark Shadows!